There is a growing traffic of visitors to what tourist brochures term "the only Rama Sita temple in the world". 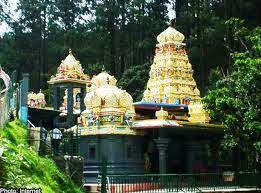 The temple, which is patterned on the modern south Indian temple, is set in idyllic countryside beside a clear stream. 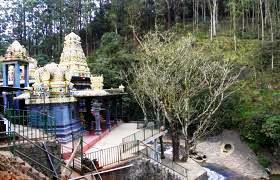 The Rama Sita Temple is at a spot believed to be the exact place where Sita was held captive by the demon-king Ravana in the Lanka of the epic, Ramayana. Myth has it that Sita, the wife of King Rama, was imprisoned in the Ashoka forests of the region. The temple trustees believe that this is no myth and that Sita's imprisonment at this spot is a historical fact. The temple complex is situated approximately 15 minutes drive from Spring Acre on the road to Hakgala on the A5 highway. The two new temples exist on a quarter-acre strip of land . One temple is dedicated to Sita, and the other to Hanuman. The Sita temple looks like any modern-day temple with a multi-coloured dome filled with mythological figures. Three new statues - of Rama, Sita and Laxman - have been installed in the new structure. On the side closer to the river bank is a small shrine with the three darkened idols which were found a century ago. The top of the roof is seen here; on the right, various groupings of Vishnu (colored blue) with consorts and devotees. On the left, Krishna (in blue, playing the flute). Photo right of Krishna is Kalki, the final avatar of Vishnu. Photo left of Krishna, carrying umbrella, is Vamana, the dwarf avatar. Photo left of Vamana is Parasurama in green, although his typical axe is missing. "There is a rock on the opposite bank where Sita sat and meditated. Also this Ashoka forest is a clear indication that she came here when she was brought to Lanka," according to the trustees of the temple. There is also a belief that at a p articular point in the stream, the water has no taste. "This is the spot she cursed. You cannot drink the water. Drink it further downstream," one temple worker said. Temple workers are keen to show visitors the spot where Sita bathed, the stone she sat on, and where she prayed. Beliefs here are evidently strong and devotees are convinced that this episode of the Ramayana epic did indeed take place here. Most places of worship in Sri Lanka (as in India) have legends, beliefs and myths associated with them. These in fact lend a special charm to such places. It is when attempts are made, often with an underlying political agenda, to give legends the stamp of history, that problems and controversies arise. This seems to be happening in the case of the Sita Eliya project. In fact, many historians of ancient India and Ceylon are of the view that the Lanka of the Ramayana lay no further south than the Vindhyas, and that the geographical position of Sri Lanka as reflected in the Ramayana was an interpolation made after trade routes with the island were opened. Indeed, the historicity of this site was denied by a leading Sri Lankan archaeologist. S.U. Deraniyagala, Director-General of the Archeological Department of Sri Lanka, said: "These are all new- fangled ideas which have the potential to create all sorts of divisions among people." He believes that the issue is "best left alone". He pointed out that there is no scientific or historical evidence to indicate that this area is connected to the Ramayana.